Disparities between low-income and high-income individuals exist even in ambulance response time, according to a recent study. It was found that it takes more or less four minutes longer for 911 to respond to calls from low-income areas compared to those from high-income areas. Researchers from the University of California, San Francisco evaluated the disparities in 911 responses for cardiac arrest in high-income and low-income neighborhoods. The study, which is believed to be the first to tackle that topic, is published in JAMA Network Open. "When it comes to a cardiac arrest, every minute counts," said lead author Renee Y. Hsia, MD, a professor of emergency medicine at UCSF, and an emergency physician at Zuckerberg San Francisco General Hospital and Trauma Center. "We found that emergency medical services response times were 10 percent longer in the poorest neighborhoods. It has been found that unequal access to medical care is one of the major factors that lead to health care disparities. But with the closures of emergency facilities and privately-owned ambulance companies, those who are in low-income communities that usually need more prehospital care have even lesser access to care. The researchers examined 63,600 cases of cardiac arrest, which they chose as the subject because of its high mortality rate and its need for immediate attention. Moreover, the time measures examined were the time elapsed from ambulance dispatch to arrival at the patient's location; from arrival to departure from the scene; from departure at the scene to arrival at the hospital; and total emergency medical services time. While EMS has not been nationally standardized yet, it has been a common benchmark to arrive on the scene in less than 4, 8, and 15 minutes, deliver CPR to patients with cardiac arrest within 5 minutes of arrival and defibrillate within 9 minutes. Meanwhile, the study has found that the 8-minute and 15-minute benchmarks were more likely to be met in high-income areas than in low-income. Overall, the average emergency response time was 37.5 minutes in high-income communities while it was 43 minutes in low-income communities. 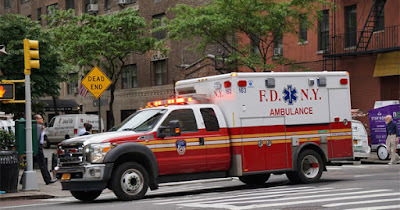 Moreover, the study concluded that the average EMS response times, on-scene times and transport times were 10 percent longer in low-income communities, despite already controlling the differences. "Each minute of delay increases the odds that a patient will not survive a heart attack," Hsia said. "Our findings are particularly concerning given the time-sensitivity of conditions like cardiac arrest, in which the heart has ceased functioning and immediate medical care is required to restore function and circulation. "Our findings show that health care disparities exist at the system level, including ambulance transport times," she added. "As hospital closures and the cost of health care continue to rise, we must examine how to ensure access to care for our most vulnerable."